Our mission is to preserve, protect, and provide public access to the records and heritage of Contra Costa County. The Contra Costa County Historical Society presents The Story of San Pablo, Last Small Town in the Bay. 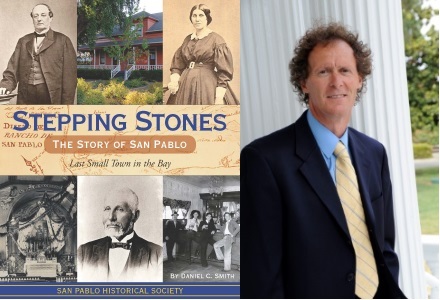 Veteran Bay Area journalist and former Benicia Councilman Dan Smith presents an illustrated talk using rare, vintage photographs from the collection of the San Pablo Historical Society. Tales of millionaires and murderers, pioneers and philanthropists, all come together in this fascinating tale described in Dan’s beautiful book Stepping Stones. Dan traces San Pablo's evolution from a Huchuin Indian village to Mexican rancho to a town that resisted the push to incorporate as a city until 1949, all the way to its being named an All-American City in 1975 and 2014 by the National Urban League. A second-generation native of Southern California, Dan Smith grew up in Hollywood and discovered Northern Cal upon enrolling at UC Berkeley. He is now a veteran Bay Area journalist and former member of the Benicia City Council. He and his wife Diana moved to Benicia in 1987 and raised their two daughters there. Stepping Stones is his first book. Admission and parking are free. Theater bar open before talk and during intermission. A book signing follows immediately. For more details on the event, click here. RSVP is requested. Email: mkting@cocohistory.org or Call: (925) 229-1042 Tours of the County archives will be available from 12pm – 2pm. Visit our online book store by clicking here or visit us in person for additional items not sold online. 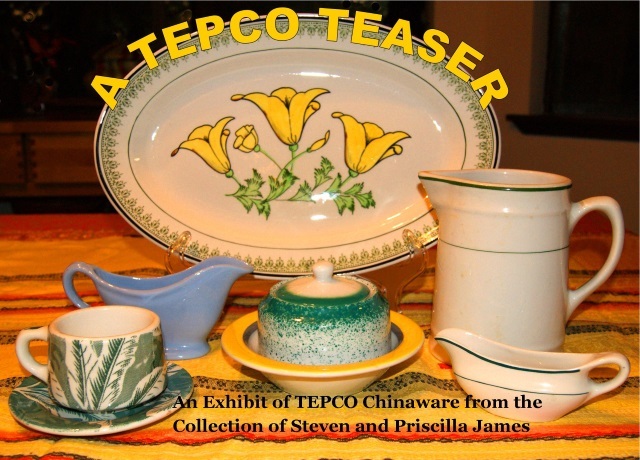 Our new exhibit, opening in September, 2018, will be a collection of Chinaware manufactured by the "Technical Porcelain and China Ware Company", more commonly known as "TEPCO". Most of the pieces on exhibit come from the collection of our Treasurer and his wife, Steven and Priscilla James. The exhibit is open to the public during our open hours, Tuesday-Thursday from 9AM to 4PM, as well as the third Saturday of each month from 10AM to 2PM. The exhibit will be open at least until the end of 2018. From 1930 to 1968, El Cerrito was home to the TEPCO factory, which grew to become the largest supplier of restaurant dishes west of the Mississippi River. Founded by John Pagliero, an Italian immigrant, TEPCO started in Richmond in 1918, until moving their factory to El Cerrito where it was the city's largest employer with almost 200 employees at their peak. With a catalog of about 50 different patterns and many dishware options (including 13 different coffee cup styles! ), there were quite a variety of pieces made. Today, TEPCO dishware has achieved something of a cult following. A "TEPCO Fan Club" was organized some years ago by Lynn Maack and his late wife, Sandi Genser-Maack. In addition to meetings every other month where members could show off their personal collections, the Maacks sent out a bi-monthly newsletter called the "TEPCO Tribune" to its 60 club members. The exhibit will include a pictorial history of the company and an examination of styles and patterns. From time to time, we may be open for special events, such as exhibit open houses, or if there is an event in downtown Martinez. Remember, we are staffed largely by volunteers, so we may not always be open the entire time. To be sure we are open, please call ahead. We are also available via email at "info@cocohistory.com". On November 2, 2015, the Contra Costa County Historical Society was chosen to be the non-profit "partner" for that night's lecture in the "Newsmakers: Lesher Speaker Series" held at the Lesher Center in Walnut Creek. In addition to a generous donation of event tickets to the society, media sponsor KTVU Channel 2 sent a video crew to the Center to make a video highlighting some of our accomplishments. The 2 1/2 minute video was screened to the audience at the event, and a copy of the finished product was given to the Society to use as it sees fit. You may see the video shown that night by clicking on this link. Looking for a gift for that hard-to-buy for history buff? The History Center offers a wide variety of books, photographs and services that they will just love. A membership in the Contra Costa County Historical Society makes a great gift too. For details on Society membership, whether for yourself or as a gift, please click here. Thanks to the tireless efforts of Board Member Steve James, producer/volunteer Santiago Chen and many other volunteers at the Center, the Contra Costa County Historical Society has released a YouTube video showing the many facets and facilities available to the public at our History Center in Martinez. If you wish to see the video, click on this link. While cleaning up the map room recently, we came across a number of duplicate copies of our topographical county maps, along with a few that were from outside the county. We are making them available for sale, but please note that the quantities are quite limited and will be sold on a first-come, first-served basis. For information on what maps available, please click on this link. Before BART - Electric Railroads Link Contra Costa County, The Book! CCCHS Past President and Curator of the San Ramon Valley Museum Beverly Lane has extended the great photos and research from our wildly successful exhibit on Electric Trains in Contra Costa County in 2012 into a booklet that the Society is proud to make available to the public. Click here to get more information on the booklet and how to purchase your own copy. Click here to see a list of the Society's charter members. You can also see a list of the Society's presidents from 1951 to the present by clicking here. The Contra Costa County Historical Society's mission is to preserve for the benefit of the people of our County, the relics of our past. We are using the World Wide Web in order to give more of us access to the wonderful stories of the people who lived in our County, so many years ago. The Society hopes that these Web pages will bring the people of Contra Costa's present, closer to those who lived, worked and died in our County and who are, our History. , Contra Costa County Historical Society, all rights reserved. 501(c)3 #23-7327190.